1st Class Fashion, the social media platform that merges fashion and luxury travel by rewarding stylish members with 1st Class flights, brings fashion-savvy Angelenos a unique social shopping experience. Join 1st Class Fashion, Teeki, Bow Appetit and AfrikaFifty6, LA Fresh, Mint and Lolly and Pretzel Crisps on September 4th for the ultimate soiree at a private jet hangar in celebration of their latest campaign initiative. Keep reading to find out more about the event and don't forget to RSVP. 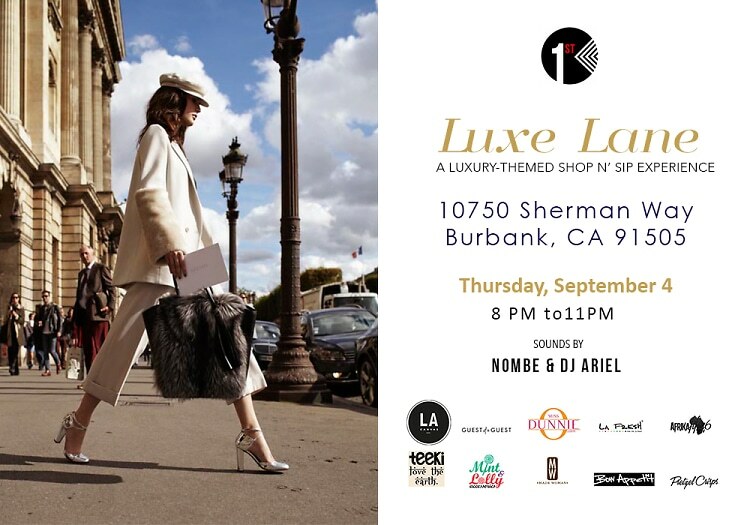 Signature cocktails will be served all night by runway model waiters and tunes will be provided by LA artist NoMBe and DJ Ariel. This event will be covered by several local media outlets such as Guest of a Guest, LA CANVAS, and Miss Dunnie O. Don't miss out on this exclusive event, reserve your spot today. RSVP here. For more information on the social revolution visit 1stclassfashion.com.